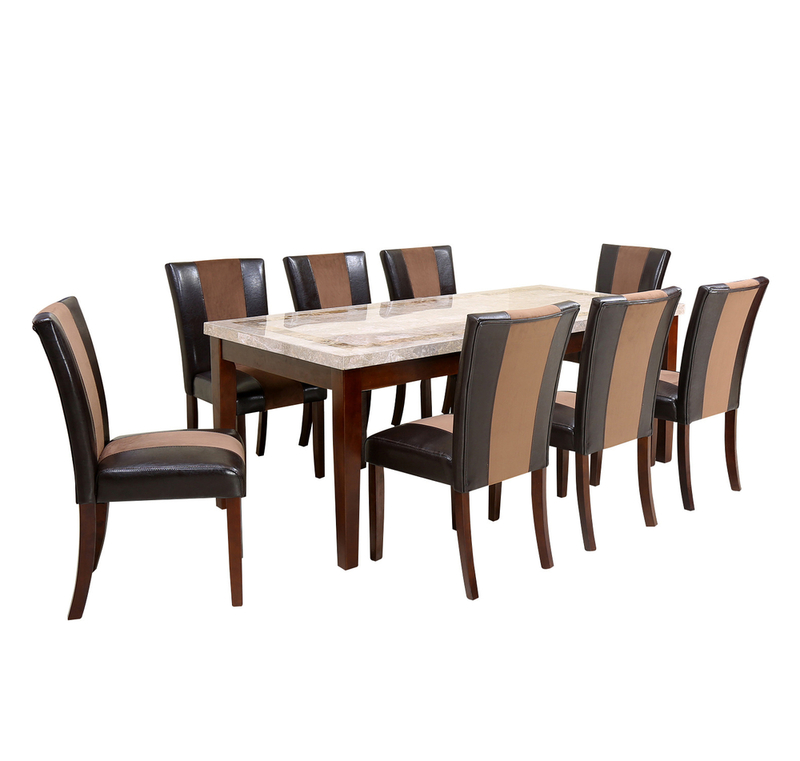 Nilkamal Jenn dining set comes with a rectangular elongated dining table accompanies by 8 dining chairs as well. The measurements of the table and chair are just perfect to fit together. The skeletal structure of the table and the chairs are made of durable rubberwood, making sure of the dining set’s longevity. The table comes with an imported European marble top about 50 mm thick giving it an extremely exotic look. The chairs, on the other hand, are covered with PVC material over the box seat foam and back cushion. All the 8 chairs come in dark walnut shade matching the legs of the table, but with a strip of beige in the middle of the backrest and the seat. The Nilkamal Jenn dining set provides maximum ease and convenience and lets you enjoy your family meals together with great comfort. The design of the whole set is a borderline antique with features like exotic marble table top and high back chairs. But it also has a touch of contemporary style in it with the fine colour combination of walnut and beige. Get the perfect combination of modern and traditional designs with the furniture pieces at @Home for your residence. Regular yet Antique design for your royal home.Chair with cushion provides maximum comfort.